I think of pink hearts and chocolate candy when February comes around. 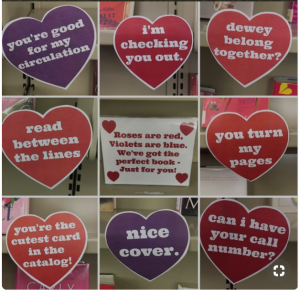 Prepare a display of books with red, pink, and white covers and then scatter these “pun-ny” hearts on the edges of the shelves. Here are ten more February display and program ideas. Educate your patrons about heart health with a display that includes resources for wellness, physical activity, and delicious healthy eating (i.e. cookbooks, exercise books and DVDs, etc.). This website includes printable handouts on many aspects of heart health. Each year beginning on February 1, an entire month of events are planned nationwide honoring the history and contributions of African Americans. The theme for Black History Month 2019 follows “Black Migrations” honoring African Americans in motion — as they moved from the farm to the cities, and from poverty to the national stage in business, politics, literature and the arts. Prepare a display of all types of library materials. This website provides 7 meaningful ways to celebrate Black History Month. Go to the ALA store for posters and bookmarks. Share some love for the library with a heart-filled bulletin board display featuring all of the things your patrons love about the library and reading. Laura Elizabeth Ingalls Wilder was an American writer known for the Little House on the Prairie series of children’s books, published between 1932 and 1943, which were based on her childhood in a settler and pioneer family. Display the series of books and DVDs of the television show based on the books. John Ray Grisham Jr. is an American novelist, attorney, politician, and activist, best known for his popular legal thrillers. His books have been translated into 42 languages and published worldwide. Celebrate by creating a bookmark that lists his titles. Display books with umbrellas on the cover along with some brightly colored umbrellas. The fun colors will perk everyone up…you could even risk bad luck by opening some of the umbrellas on display. Celebrate all presidents past and present with a display of biographies and autobiographies. A favorite of the Texas Rangers cavalry, Samuel Colt patented his revolver design on this day in 1836. Build a display of cowboy and western films and novels. This day says that you must reduce your carbon emissions and lower your thermostat level at least on February 27. On this day, many zoos will advertise and encourage visitors to show their support for polar bears. Display both children and adult books about polar bears and endangered species. Gather and display all your picture books that are based on the Tooth Fairy. Follow me on Pinterest for even more Display Ideas!